I’m often asked to suggest books for radical reading purposes. “I wanna know what’s really going on,” it typically goes, “but where do I start?” My standard recommendation for your run-of-the-mill, garden variety, weaned-on-Fox American begins with a list of two: “A People’s History of the United States,” by Howard Zinn and Killing Hope, by William Blum. Zinn, for many, is no surprise. Blum, however, is less renowned but no less notorious...or essential. He may not have been name dropped in a Matt-and-Ben flick, but his work is required reading for anyone who craves context and documented data on the realities of U.S. foreign policy. MZ: On the jacket of your latest book, you say: “The United States runs the world like the Taliban ran Afghanistan.” How would you concisely explain what you mean by this to someone mired in mainstream American culture? WB: If they have a halfway decent knowledge of how the Taliban ran Afghanistan, then the examples I give in the same statement would be my explanation. If they have no knowledge to speak of about the Taliban (which would apply to millions of Americans, I’m sure), then it’s sort of hopeless. It’s not easy to undo a lifetime of conditioning with a few sentences. How can I match 10000 hours of Rush Limbaugh, Fox News, and The National Enquirer? In the current edition of my newsletter, The Anti-Empire Report, coming out soon, I write about such people, whom I call the Valueites. There is now thought amongst progressives about reaching such people, trying to win large numbers of them over. This is certainly an understandable goal, but I suggest that we not waste our time, energy, and resources. Certainly, with any one individual amongst them, if we secluded that person on a farm with a dozen articulate progressive activists for a year, and with a plethora of moving audio-visual materials, something would probably click in that individual’s head. But we haven’t got enough activists, time, or farms to make even a crease in the target population of “Valueites”. As ignorant and lacking in imagination as they might be, these people, if transported to Iraq to see the bombs falling, the houses destroyed, the missing limbs, and the mangled children’s bodies; if forced to look upon and smell the burning flesh of victims of policies they support—even such Americans would be moved to a higher political consciousness. This has already happened with a number of American military personnel in Iraq, but is of course impossible to arrange for the many Valueites. MZ: If trying to reach the Valueites is “a waste of our time, energy, and resources,” what avenues would you suggest for the 21st century dissident? WB: I wasn’t commenting about the methods, only the target of our methods. We have in fact reached huge numbers of people who would otherwise not have become informed dissenters. And there’s an unlimited number of more of such people out there just waiting for “enlightenment” or waiting to learn that they’re not alone in their thinking. We have to keep doing what we’ve been doing. The fact that we didn’t stop the war doesn’t mean that we haven’t been successful in recruiting. And we have to assume that this will pay off in ways that can’t be entirely foreseen, when our numbers reach a critical mass. MZ: What role do you see your work playing in the effort to create a more just society? WB: Only in education, per the above. I’m not about to lead a charge into the Pentagon, so I’ll stick to writing and speaking. I think because I was a “believer” for almost the first half of my life I understand what confusions and what questions are in the minds of those who are not yet with us, and so I’m able to address those concerns without even being asked. MZ: But, do you ever feel like we just don’t have enough time to reach the number of people it would take to achieve the critical mass you mention? How can one blend patience and urgency? WB: What is the alternative? Immediate armed revolution? I don’t know what else to do. MZ: I’ll assume one alternative you don’t agree with is supporting candidates from the Democratic Party. Were you surprised so many high profile lefties supported the Anybody-But Bush agenda in 2004? WB: I was surprised, but I wouldn’t say they supported any agenda other than defeating Bush. But it was not a principled support; in their statement they could not, and did not, say a word in support of Kerry. MZ: And how do you feel about the public anointing of George W. Bush as the “worst president ever”? WB: As I discuss in the introduction to my new book, there’s virtually nothing bad done by the Bush administration that has not been done repeatedly by previous administrations. I think Bush’s very limited appeal as a person has produced a good portion of the hatred of him. Clinton, as one example, could get away with his disgusting policies easier than Bush can because Clinton could at times come on as educated, articulate, and “charming”. MZ: I’m glad you mentioned your new book. In your humble opinion, why should someone buy this “Freeing the World to Death”? WB: One reason is that I would like the money. Another is that it’s a good read for anyone interested in world affairs, US foreign policy, history, the Cold War, PanAm 103, Cuba, terrorism, the War on Terrorism, socialism, and lots more; all written in a readable manner, with even some laughs. MZ: What advice would you offer someone just starting out as an activist/writer? WB: The advice I give to any kind of writer is simply to write, write, write. If you put it off you’re doomed. When you read other people, don’t just read for entertainment and information, study the style. If it’s something you like, read it again to figure out what it is you like; same for something you don’t like. Don’t give your writing to a dozen people for their commentary; the contradictory opinions will drive you crazy and can make you feel confused and insecure. Give it to only two or three people whose opinions you respect. Don’t worry about any “rules of writing”. Be unorthodox if it fits your subject and point of view; don’t be afraid to gamble with style; you’ll learn from your errors. If you want to use your writing as a tool of activism be prepared to not be rich. I’ve been lucky enough to make a halfway decent living out of my writing and speaking, but it took me a long time to reach that point; so keep your day job for awhile. Books are a much better way to make money than journalism. MZ: What’s it like being an elder statesman of dissent? WB: I have no such feeling about myself. If I have any prominence in the world of dissent, it’s only been reached in the past few years. So I can’t begin to feel like Chomsky, Zinn, Parenti, or many others. That’s not false modesty speaking. But I can say that I am surprised by any indication of any prominence, including your question. I did not have my first book published until I was 53. So maybe I’m the Granma Moses of radical writing. 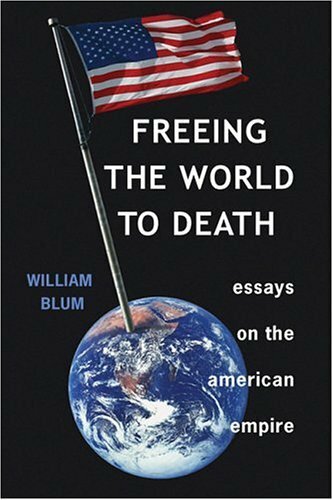 * For more on William Blum please visit: www.killinghope.org.